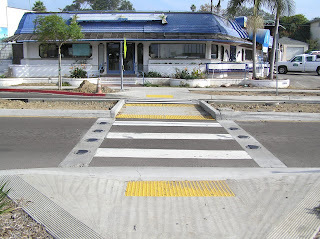 Driving through Santa Monica over the long weekend we encountered a pedestrian waiting at one of these--and a dilemma. Being the well-trained pedestrian-advocate's partner that he is, my husband slowed to stop for the pedestrian--just as the vehicle next to us sped up to catch the green light at the next intersection. Some improvement in yielding to pedestrians has shown at most locations where in-roadway flashing lights have been installed, but it is not always dramatic or consistent across all conditions. The effect of in-roadway flashing lights on vehicle speed is unclear. Some studies showed a reduction in vehicle speeds following treatment installation, while others showed no reduction or mixed results. The two studies of in-roadway flashing lights at multi-lane roads also produced inconsistent results in terms of whether or not the treatment improves yielding to pedestrians, leading the PBIC to recommend that "caution should be exercised, and perhaps additional treatments implemented if [an in-roadway warning light system] is considered for uncontrolled crosswalks at multi-lane locations." That last recommendation is more cautious than what you might observe elsewhere in discussions on the in-roadway flashing light treatment, and brings me back to our weekend drive. As we passed through the crosswalk in question, my husband wondered if he should have stopped and waited for the pedestrian to cross (despite the other driver) or continue through--thus clearing a gap for the crosser. My answer was "neither." Instead, the City of Santa Monica should have made it obvious which action was appropriate. In practice, this probably means improving and increasing the crossing treatment. Not to say Santa Monica isn't far ahead of most jurisdictions in that department, but as we've learned from past studies, it often isn't enough to just slap down one crossing treatment and call it done. If there's a possibility of ambiguity or confusion (for either the driver or the pedestrian), then the treatment isn't good enough. 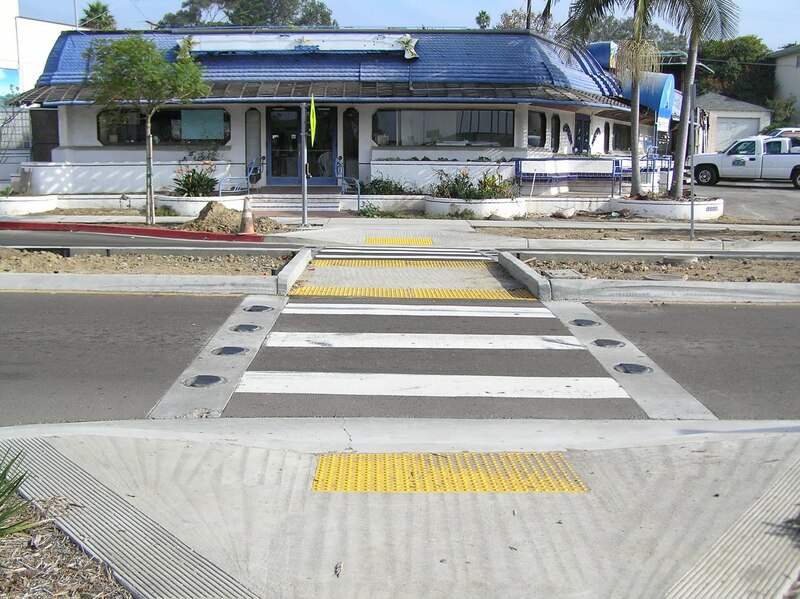 As the maxim of pedestrian crossing design goes: when in doubt, do more. Flashing yellow = yield, SM doesnt have to be any clearer. Just like flashing red = stop. The law is to yield for pedestrians in crosswalk, so even without the flashing lights, your husband had the duty to stop. Theres a flashing light treatment near my home. Id say 95% of cars obey it and stop. Thats up from maybe 2% at nearby unmarked and unlit crosswalks. Technically, in California flashing yellow = "proceed only with caution" according to the vehicle code (see Sec. 21457b), which to me is not quite the same as "yield." Moreover, it's unclear to me if that law applies to in-roadway flashing lights, as those aren't specifically addressed in either the vehicle code or the SM municipal code. I'd be curious to hear if others have experience with this. If no pedestrian is in the walkway or waiting to cross, I would say slow and proceed with caution.